Michael Schulson, who has been on a tear of late with splashy restaurants, just rolled out a steakhouse. What's he thinking? Also this week, our stops include a Central American BYOB in South Philly and a microbrewery with a quirky back story in Glenside. Not to be outdone, editor Alison Smith heads to the inviting Malvern Buttery for brunch. "Bigger" is the operative word in restaurants. More seats (assuming you can fill 'em) means more potential revenue. Then why has Michael Schulson opened a steakhouse with only 40 seats? Because he can. He views Alpen Rose (116 S. 13th St.), which forms the end of a row of Schulson restaurants in Washington Square West (Sampan/Graffiti Bar and Double Knot), as a chance to complement his portfolio with something bold yet intimate. 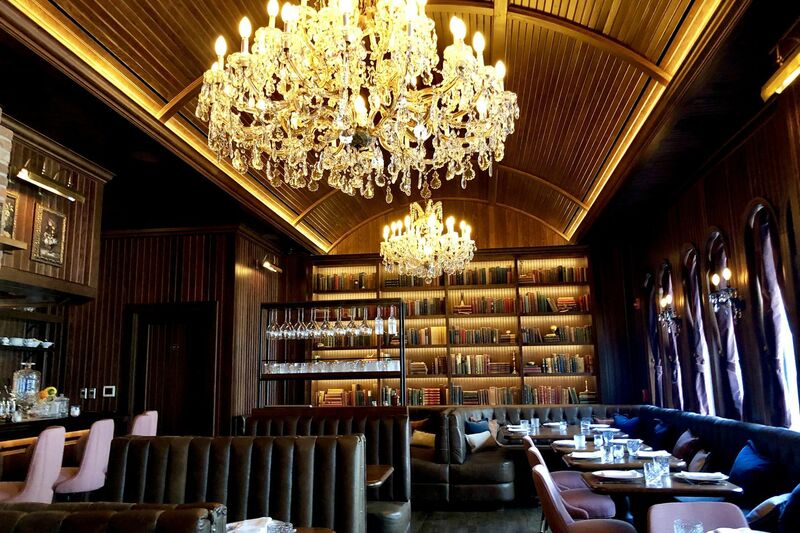 Library-like decor, beneath crystal chandeliers, has that predictable steakhouse richness, but the mismatched plates and cutlery help provide a homey touch. You can see the open hearth in much of the dining room. Under chefs Leo Forneas and Michael Le, Alpen Rose has a room for 14- to 120-day dry-aging. Steaks start at $35 for an 8-ounce grass-fed filet, and there are numerous sharing options, up to a 48-ounce Tomahawk for $110. Sides include the familiar (creamed spinach), the artistic (a tower of beer-battered onion rings), and the creative (roasted cauliflower "steak," which can be made vegan). Figure on about $75 a person, maybe a couple bucks less than the Center City chains. Find more details here. Hours: 5-10 p.m. Sunday-Tuesday, 5 to 11 p.m. Wednesday and Thursday, 5 p.m. to midnight Friday and Saturday. Soul-food destination Big George's Stop N Dine offers chicken and sides at this takeout at 5148 Locust St.
Western suburbs Mexican chainlet has opened at 5 W. Lancaster Ave.
Skewers and hot pot are the specialties of this Chinese restaurant at 927 Race St. from a partner in Ting Wong. Two couples have opened this bar/bottle shop on Richmond Street near Allegheny Avenue. Modern/industrial-look Vietnamese at 226 Haverford Ave.
New location, complete with bar, for Philly's most hyped pizzeria, at 1313 N. Lee St.
Tabletop BBQ and Korean cuisine, plus beer and soju cocktails, at 66 Rittenhouse Place. Bagel shop at 22 N. Bryn Mawr Ave. The longtime bar-restaurant at 4439 Main St. has set an April 1 reopening under new owners. Moon Krapugthong has moved her Japanese restaurant to 4345 Main St., next to Chabaa Thai. No reported closings this week. This sunny bakery/coffee shop/lunch spot down the street from SEPTA’s Malvern station serves a great latte, house-made pastries (Craig LaBan calls them some of the best croissants in Philadelphia, and he’s not wrong) and sandwiches — all on the honor system. Pollo con tejadas as server at El Bocado, 1005 E. Passyunk Ave.
Jackie Martinez, a young mom whose Salvadoran/Honduran family has been in the local restaurant business for several years, oversees this cozy, family-friendly BYOB at the crossroads of East Passyunk Avenue and Seventh Street, just north of Washington Avenue in Bella Vista. Menu takes in Honduran and Salvadoran cuisine, though Martinez told me that she felt obliged to include more familiar Mexican dishes just to keep the locals happier. You'll see the Central American accent in the enchiladas ($9), served Salvadoran style with crispy tortillas, ground beef, coleslaw, roasted tomato sauce, hard-boiled eggs, tomato, and Parmesan cheese. Chuleta asada ($12) is a tender grilled pork chop served with rice and beans and salad. For rib-sticking indulgence, try the pollo con tajadas ($12), a platter of fried chicken, fried bananas, cabbage, roasted tomato sauce, pico de gallo, Parmesan cheese, and a mayo dressing. Wash it all down with horchata and other fresh juices. Hours: 11 a.m.-10 p.m. Friday to Wednesday (closed Thursday). The pork sandwich at Billâ€™s Best in Glenside. How's this for a back story: Family creates delicious barbecue sauces, based on the recipes of patriarch Bill Fehon. Son Jason, a producer and weekend DJ on WMMR, has a passion for beer. There's space at Bill's Best's production facility in Glenside. Why not start a microbrewery, and invite the neighbors in for beers and pork barbecue sandwiches topped with the sauce? Two weeks ago, Jason and his mother, Diane, opened the doors to the warehouse-like space, and the crowds have been packing the bar and tables for budget-priced cocktails, local beers, and notably brewer Synn Estvedt’s three changing tap selections. The other day, I enjoyed a Due North, an NEIPA (7.2% ABV) with forward flavors of melon and pineapple, to accompany a pork sandwich, basically the only food on the menu. The Fehons use pork from Stryker Farm near Allentown (a wholesale sauce customer) and build it on a brioche bun. You can choose five toppings, making for a delicious messiness that the accompanying photo conveys. The honey barbecue sauce, one of three, is available for purchase by the bottle. Hours: 5-10 p.m. Thursday and Friday, noon-10 p.m. Saturday, noon-8 p.m. Sunday. Where have all the oyster crackers gone? Original Trenton Crackers were a staple in oyster houses all over the region. When the manufacturer stopped making them, it caused outrage among lifelong customers. Delco landmark Charlie’s Hamburgers, whose beefy creations routinely appear on best-burger lists in the region, is moving five minutes down the road. You can use Dogfish Head’s new beer to develop Kodak Super 8 film, and they made a video featuring Philly to prove it. Critic Craig LaBan is on assignment. Email questions here.